Aspergillus clavatus is a species of fungus that is widespread and can frequently be found growing in soil and animal manure. It is also common in cereal-based foods. A. clavatus is pathogenic and capable of producing mycotoxins, specifically the toxin patulin, which is associated with several pulmonary diseases in humans and other mammals. A. clavatus is also allergenic, causing hypersensitivity pneumonitis (also known as “malt worker’s lung”) in subjects exposed to high levels of its spores. What is Aspergillus clavatus mold? Aspergillus clavatus grows as a mold. It forms a velvety felt that is greenish blue in colour, often with a whitish margin around the edges . 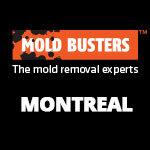 Molds produce millions of microscopic spores that are referred to as conidia. Aside from reproduction, conidia are also a means by which molds are dispersed to contaminate different locations and spread as a disease. Since its discovery in the early 19th century, A. clavatus has been well characterized and identified. Like many other fungal species, A. clavatus produces a number of secondary metabolites, many of which have antibiotic properties and have found uses in the pharmaceutical industry. On the other hand, other secondary metabolites are classed as mycotoxins and can cause potentially life-threatening illness. This mold grows optimally near 25°C (77°F), with minimum growth at 5°C and maximum near 42°C (41–107°F) . It also requires a good level of humidity to grow, with no growth reported at water activities below 0.87 . It therefore thrives during summer, and all year round in tropical and subtropical areas. A. clavatus primarily grows on soils, particularly cultivated soils such as those bearing barley, potatoes, cotton, sugar cane and legumes. It also commonly grows on animal dung and on decomposing materials. In urban settings, this particular species can grow in wet or moist areas of homes. It can also be found in food stored in humid areas, such as improperly stored rice, corn or millet . This species is not as pathogenic as some other Aspergillus species. Many people inhale and consume A. clavatus spores on a regular basis without getting sick. A normally functioning immune system is equipped to handle the incursion of many types of foreign bodies, among them, fungal spores. It is, however, pathogenic to some people, especially those with a compromised immune system. Additionally, some people are allergic to this mold. 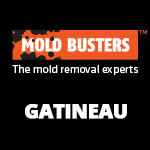 Patulin toxicity: A result of exposure to mycotoxins produced by this mold. Pulmonary aspergillosis is a collective term used for several pulmonary disorders caused by an Aspergillus infection. In most cases, it does not occur in normal, healthy individuals, as Aspergillus is a weak pathogen. The disease usually affects immunocompromised individuals, such as those undergoing organ transplant therapy, chemotherapy for leukemia, and among people living with AIDS. However, pulmonary aspergillosis can also affect people with underlying lung diseases such as tuberculosis or chronic obstructive pulmonary disease, but with otherwise normally functioning immune systems . The rest of the health conditions, especially those that are serious and life-threatening, arise from allergic reactions to A. clavatus spores. 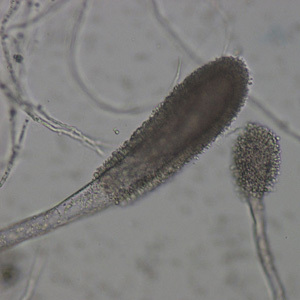 The mold’s conidia are very strong allergens. When a person is repeatedly exposed to them, their body mounts a hypersensitive immune response that ends up damaging the surrounding tissue. This leads to various illnesses in the lungs and airways when inhaled, and in the digestive system if ingested orally. This is the most well known and most serious form of an Aspergillus allergy. It occurs when a person repeatedly inhales large amounts of A. clavatum spores. It is more of an occupational disease as it occurs in individuals working in barley plantations and those working in breweries. This is because this type of mold grows well in the cultivated soil. As for breweries, heating of barley during malting releases large amounts of spores into the air. Workers in these breweries are often affected by lung diseases due to excessive exposure to the spores, hence the term “malt worker’s lung” disease. The disease causes symptoms that progress from acute to subacute, and ultimately reach a chronic stage. In the acute stage, the primary symptoms are coughing, chest tightness and difficulty breathing. One may also experience systemic symptoms such as fever, chills, malaise and headaches. If left untreated, the disease progresses to the subacute phase, with a marked loss of appetite and consequently loss of weight. The affected individual may also experience general body fatigue. By the time the disease reaches the chronic phase, lung function is fully compromised and respiratory distress sets in. Physical symptoms of inadequate oxygenation can be observed, such as finger clubbing. There is also significant wasting. At this point, the disease is irreversible. Apart from being directly infected by the fungus, one can also experience serious health effects from exposure to the toxins produced by A. clavatus. The most notable mycotoxin of A. clavatus is patulin. It is commonly found in apples and apple products such as fruit juices, jams and cider. It is can also be found in other fruits such as berries, bananas, plums and cherries. Once ingested, patulin results in gastrointestinal irritation. This is manifested as stomach pains, vomiting and diarrhea. It also causes difficulty breathing, coughing and accumulation of fluid in the lungs. In worst-case scenarios, patulin poisoning results in neurotoxicity, which can cause life-threatening convulsions and neurologic deficits. It is, therefore, a serious medical condition. Apart from patulin, A.clavatus produces a host of other mycotoxins, including tryptoquivalones (toxins isolated from a moldy rice sample associated with the death of a child ) and cytochalasin E (a mycotoxin which inhibits the formation of blood vessels). Treatment depends on the specific condition. Infections such as pulmonary aspergillosis often respond to antifungal therapies consisting of itraconazole and amphotericin B. Chronic conditions such as “malt worker’s lung” disease can be much harder to treat. Anti-allergy medication is used in the early stages and anti-inflammatory medication such as corticosteroids in serious diseases. But in general, it is always better to prevent the conditions as their treatment is lengthy and complicated. 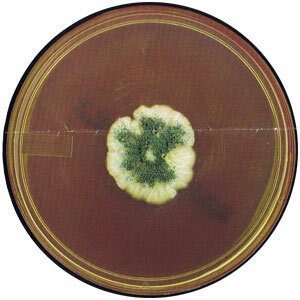 The standard approach to prevent infections due to Aspergillus clavatus is to minimize exposure by eliminating all possible sources of this mold. For farmers, use of protective gear when working on the fields should be standard practice. Factory workers are also required by law to wear bioprotective masks. 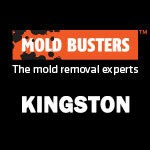 For A. clavatus contaminations of households, professional mold removal and thorough decontamination is the way to go. This is especially important in homes occupied by immunocompromised individuals and those with chronic lung diseases, such as asthma and tuberculosis. All surfaces need to be treated with antiseptic solution, with keen attention to moist and wet areas (around sinks and drains in bathrooms and kitchens). For most people, this is not a simple DIY procedure. 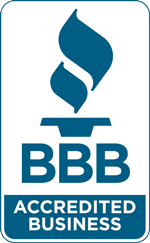 That’s why it is best to consult a professional mold removal company that has the knowledge of and training in safe, standardized protocols for mold remediation and hazardous waste removal. 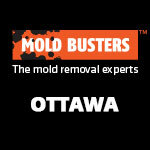 If you suspect mold growth in your living or working environment, contact the certified mold experts at Mold Busters—we offer comprehensive mold testing, air quality testing and mold remediation services. Panasenko VT (1967). Ecology of microfungi. Bot Rev 33: 189–215. Northolt MD, Van Egmond HP, Paulsch WE (1978). Patulin production by some fungal species in relation to water activity and temperature. J Food Prot 41: 885–890. Smith N, Denning DW (2011). Underlying conditions in chronic pulmonary aspergillosis including simple aspergilloma. 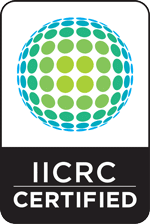 European Respiratory Journal 37 (4): 865–872. Büchi G, Luk KC, Kobbe B, Townsend JM (1977). Four new mycotoxins of Aspergillus clavatus related to tryptoquivaline. J Org Chem 42: 244–246.